Around this time, the mid-1800s to the early 1900s, wilderness began to be considered “beautiful” rather than “uncivilized.” Outdoor recreation became increasingly popular. Wilderness advocates like Henry David Thoreau and John Muir called for the preservation of “primitive areas.” And a number of those who were able to afford it, including Johnston and several of his friends, put the call into practice. 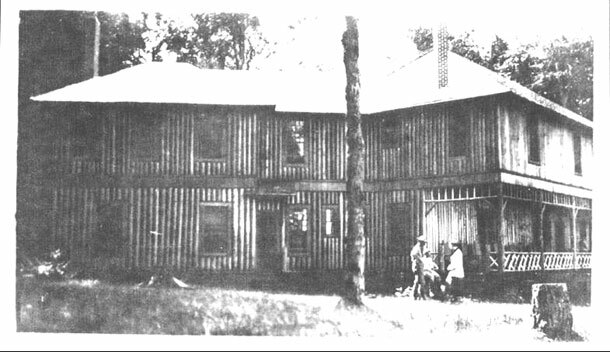 Johnston opened his two-story log house with five upstairs bedrooms to vacationers who came to the “Johnston Camp” to fish, hunt, gather wild fruit, and swim in the lake. Several of his friends, mostly wealthy United States Steel Corporation executives affiliated with the UP mining industry, fell in love with the old-growth wilderness and began to purchase acreage surrounding Johnston’s land in 1900-1903, eventually amassing over 18,000 acres. Together they formed the “Sylvania Club,” a private hunting and fishing retreat. However, unlike some other clubs of this type, the land was owned jointly by only a handful of people. The charter members of the club were Thomas F. Cole, William Ellis Corey (US Steel president 1903-1911), James Gayley, Daniel M. Clemson, David G. Kerr, and Thomas Morrison. A noted Michigan businessman, Otto C. Davidson, joined them a few years later. Johnston retained ownership of his acreage. His widow sold her shares to the Sylvania Club in 1923. Due to the death or departure of several members, three more men bought into the Sylvania tract: William Boyce Thompson, who owned Newmont Mining, one of the three largest mining companies in the world, in the 1920s; Clarence M. Christiansen, a sawmill owner from Phelps WI, in 1937; and Fred Fisher in 1940, who died a year later, leaving his shares to his brother Lawrence, Director of General Motors. 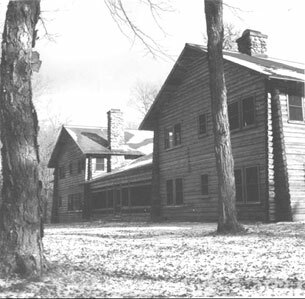 The Sylvania Club built a clubhouse, Wildwood Lodge, in 1906, and later several additional lodges and caretaker cabins, most of them on Clark Lake. 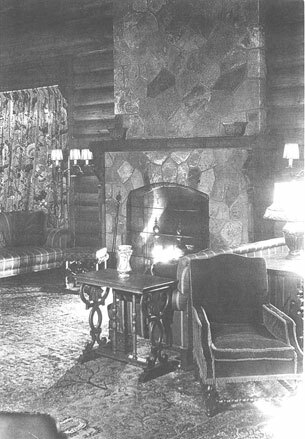 The largest of these buildings, the Thompson lodge, featured 16 bedrooms, 13 fireplaces, an indoor tennis court, and European antique furniture. It was constructed from logs brought by rail and, for the last 7 miles, hauled by a team of horses. The club members enjoyed entertaining their friends. They organized hunting and fishing excursions, wagon rides through the forest, and parties. Large amounts of forbidden whiskey were stored on “Whiskey Island,” near the south shore of Clark Lake. And there was fun: Hunting guides would point to a life-size replica of a red deer, the “Iron Duke,” hidden in the forest; but some guests were not amused when their bullets hit the metal. In the 1940s, Eisenhower came to fish, Lawrence Welk helped in the kitchen, and Bing Crosby sang in Watersmeet’s Catholic Church. The main reason for the existence of the Sylvania Club was the members’ deep appreciation for nature. Only rustic roads and hiking trails connecting the lakes were established. Wire fences, signs, and iron gates were erected. Guards (some armed) lived in small cabins on several key lakes looking out for trespassers as well as forest fires. Wild rice was planted on Crooked Lake. The lakes were stocked with fish, including lake trout from Lake Superior which can still be found in the deep, cold waters of Clark and High Lake. A few trees were felled so that they landed in the water (simulating beaver activity) to provide fish habitat. Only about 10% of Sylvania experienced some type of logging. In the late 1800s, the most valuable tree species were red and white pines. These are not abundant in the Sylvania forest, which consists mainly of hemlock and hardwoods. When hardwoods came into demand in the early 1900s, massive logging transformed the remaining forests in northern Wisconsin and the UP. Sylvania was saved by a handful of men who had the means and the desire to preserve this wilderness for themselves and, ultimately, for those of us who enjoy it now, and for future generations.